This web exhibit presents original documents and secondary sources on the Triangle Fire, held by the Cornell University Library. They are housed in the Kheel Center for Labor-Management Documentation and Archives at Cornell University's ILR School. Cornell University Library's Division of Rare and Manuscript Collections also contributed to the exhibit. The bulk of the primary sources were drawn from the International Ladies' Garment Workers' Union Archives which, along with the records of the Amalgamated Clothing Workers of America, form the basis for the archives of the Union of Needletrades, Industrial and Textile Employees (UNITE!) which reside at Cornell. The exhibit includes most of the Triangle Fire-related sources available at the Kheel Center. Not posted on the site is a partial but extensive transcript of the trial, and documents on subsequent commemorations of the fire. If you have additional information or resources or are interested in donating Triangle Fire-related original documents, please contact the Kheel Center. 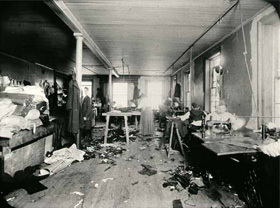 This site includes selected information on a terrible and unnecessary tragedy involving the death of many young working women in a New York City sweatshop at the beginning of the 20th century and the resulting investigations and reforms. You will find original documents, oral histories, and photographs. You can hear and read first-hand accounts by survivors and others that will provide a glimpse into the lives of workers and a sense of the horrors of a factory fire that claimed the lives of 146 young workers. A selected bibliography of sources on sweatshops and the Triangle Fire includes sources for teachers of history. The bibliography is called "selective" because it is not comprehensive. We have attempted to provide a thorough selection of fire-related sources but an enterprising student will be able to locate many more sources on sweatshops, conditions of work, investigative practices, and protective legislation. The site was originally inspired by, and was a response to, a steady flow of requests for information on the Triangle Fire that the Kheel Center was receiving from middle and high school students. It was designed to provide an easily used resource to assist in the writing of class papers. Individuals wishing to undertake in-depth research will find it to their benefit to contact the Kheel Center. This exhibit is the second re-design and expansion of the original Triangle Fire site published in 1998. The version that this one replaces was designed and produced in 2001 by Linda Fisher and David DeMello. The original exhibit was inspired by a multimedia undergraduate student project on the Triangle Fire, supervised by Patrizia Sione in 1995 while teaching her Labor History Survey course. Librarian Constance Finlay sparked the idea and provided help with technical details; archivist Hope Nisly helped with the archival materials. The students assembled the text and the audio-visual material (and received an A for their project!). Their original report is unfortunately lost, but their work convinced the staff of the Kheel Center that enough documentation existed on the Triangle Fire to create an expansive online exhibit on the topic. The Kheel Center would like to thank Mrs. Miriam Stein and Barbara Ismail for granting permission to use selections from the late Leon Stein's books, Out of the Sweatshop and The Triangle Fire.